I ran across this blog post in early December and was greatly impacted by the simplicity of its concepts. Ever since my son Logan was born 2 years ago my husband and I have talked about how we really want to instill in him a heart to give and serve. I often get frustrated because I feel like we “talk” a lot and then we have a hard time following through. Since having Logan we have done a few small service projects but have definitely not done as much as I would have liked. Finding projects that are appropriate to the toddler and preschool ages is tricky! Anyway, this article struck me because the main premise was just being charitable and giving at home…I can totally do that! We are our children’s role models and if they see us doing nice things, even if it is just for Daddy or Grandma, they will remember. 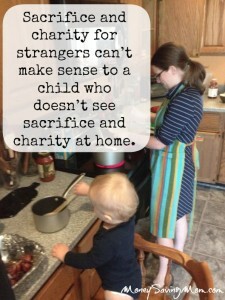 So, my biggest advice for giving as a family is to start small at your home. The text is definitely for older kids, but all project ideas can be adapted for our preschoolers!